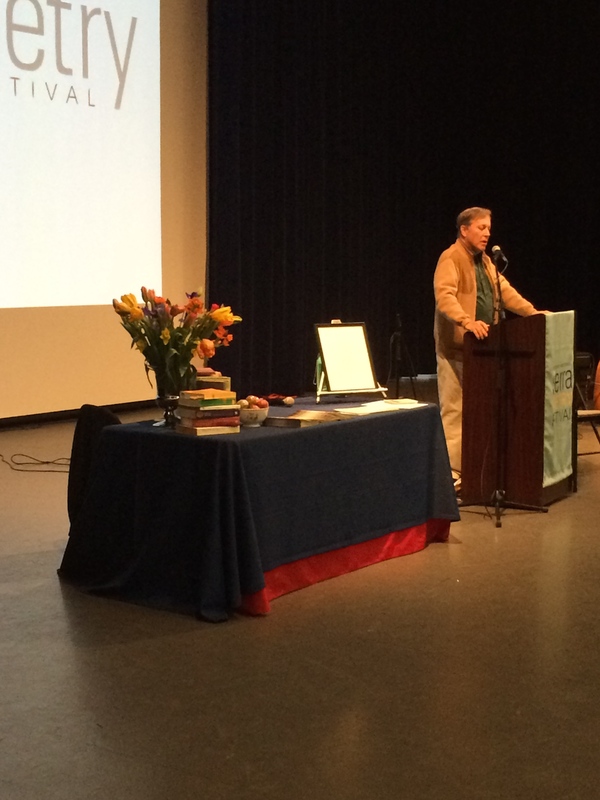 We were proud to support the inaugural Sierra Poetry Festival, which drew over 100 people to Sierra College’s Nevada County campus on Saturday. In his keynote address, Stanford graduate and award-winning poet Dana Gioia, currently the Poet Laureate of California, gave an upbeat assessment of funding for the arts — despite the philosophy of the current White House administration. Gioia cautioned, however: “You can never stop advocating for the arts.” Gioia is the former Chairman of the National Endowment for the Arts. (Dana and his wife, Mary, divide their time between Los Angeles and Sonoma County). The day included poetry readings, workshops, a lunchtime open mic, and a literary vendor fair. Poets and writers included locals and out-of-towners from as far away as England: Gioia, Kazim Ali, Eve Bradford, Gayle Brandeis, Gene Berson, Kirsten Casey, MK Chavez, Guari Delgado, Charles Entrekin, Gail Rudd Entrekin, Molly Fisk, Sands Hall, Jahan Khalighi, Jonathan Kinsman, Genny Lim, Shawn Odyssey, Mel Pryor, and Al Young. Others included filmmaker Pablo Frasconi and Shelly Covert, spokesperson and tribal historian for the Nevada City Rancheria Nisenan Tribe and director of C.H.I.R.P. (California Heritage: Indigenous Research Project). Fisk was named Nevada County’s first poet laureate. She is the author of poetry collections, The More Difficult Beauty and Listening to Winter, and the essay collections Houston, We have a Possum; Using Your Turn Signal Promotes World Peace; and Blow Drying a Chicken. Her radio commentary “Observations from a Working Poet” airs weekly. Nevada County Supervisor Richard Anderson was in attendance.